Gift Labels are the perfect finishing touch to any gift box, tissue, envelope and more! Gift shops, jewelry stores, and other businesses looking to add a touch of glamour to their items with gift labels. 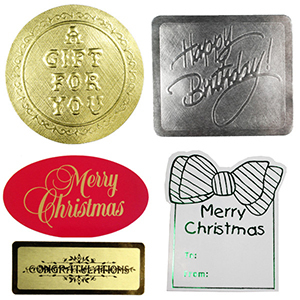 At American Retail Supply we offer the opportunity to design & customize gift labels! You can choose from a huge selection of sizes, shapes and colors as well as choosing from hot stamped or printed gift labels. All gift labels are sold by the case and come 250 labels per roll.